Something had happened to change the place overnight. It was as though a troupe of elves had moved in while everybody was asleep and worked their magic, and now you could scarcely recognize the place at all. 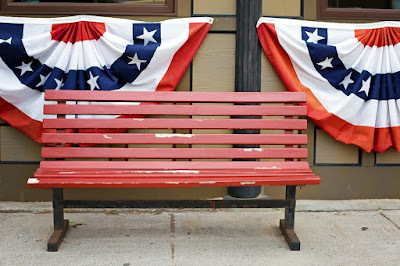 Everywhere one looked there were banners and bunting, and red, white and blue streamers hung from every surface. Even that redwood fence which ran along the path for some distance in the direction of the snack bar seemed to have virtually disappeared, covered as it was by festoons of a patriotic hue. It was all part of the signal event known as the mock election. It had been at Stevenson Junior High ever since the school was founded 20 years before, and had only grown in stature during the intervening time. Every four years, political analysts and experts from all across the country would descend upon the small northern California town of San Sereno, poring over the data which represented our accumulated results as though it were some sort of oracle from on high. As a result of which, those of us who had acted merely as participants in the electoral process given the rather uncanny sensation that our school--for that moment, at any rate--was the center of things. As we sat in our homerooms that morning, we were treated to a very rare event indeed: an address from Principal Searbel. He first took the opportunity to thank everyone on the faculty and staff involved with the decorations. He said that he had hardly recognized the place upon driving up to it that morning (and a small ripple of laughter passed through our class at that, as Miss Hansen smiled her secret smile off in the background). He told us that he had been at Stevenson Junior High for 13 years, as a faculty member, vice principal, and (now) principal. In that time he had been fortunate enough to participate in three of the mock elections, and he had had the opportunity to watch the event grow tremendously in significance over the years. "And so it is you, the student body, whom I mainly wish to address today: those of you who will be acting to decide our nation's president and the fate of the many state propositions, as next month your parents and others will face a similar challenge. You have been entrusted with a great privilege and duty; I hope you see it as both as you walk into the booth to cast your ballot today, and I trust you will use the opportunity wisely, all of you. I also hope that you draw from this experience a greater sense of history, recalling all of those throughout our past who have been allowed through our democratic process to shape and decide their own futures." He assured us that every single one of our votes counted, and he urged us to take a moment to exercise our right as citizens sometime during the day. "It is up to you to make this day whatever you wish it to be," he concluded. "Most of all, I hope you see it as a celebration of yourselves." The first campaign rallies were held during morning break. And so I found myself in the midst of a veritable ocean of people, as we attempted to pass around our campaign buttons (one told one's homeroom teacher which side you were backing and thus received your supply). Not that there seemed to be any great or pressing need to proceed on our mission. It was already clear that our ranks vastly outnumbered those of the opposition; the more optimistic amongst us were beginning to think in terms of a landslide. This attitude was only bolstered by rumors that some of our fellow supporters were having a difficult time getting their buttons; several of the homerooms were said to have run out of theirs, and people were being directed over to one of the temporary buildings to stock up further. One found that it was generally impossible to get the attention of the eighth graders. You could only wave the pins in their direction, attempting to find somebody you knew and could perhaps persuade, hoping that maybe one of them would notice you, not for the usual purposes of ridicule but to decide that they wanted to wear what you were holding. Often they said--whenever they spoke to one of us at all--that they were in favor of what we were saying, but that they didn't want to be enlisted for the purposes of walking around on some rally. They weren't all that taken up by the cause, so to speak. Mostly we (I along with my fellow seventh graders) attempted to ally ourselves with the other eighth graders who were campaigning with us, which worked out rather better in our favor. Thus was many a conversation started up, marked by the usual sorts of pleasantries. Then, once that obstacle had been breached, one would be able to move on to the subject at hand. And another button would be passed out, another soul won for the cause. Other seventh graders, we were, of course, able to address on an equal footing. Then there was that inchoate mass of sixth graders, wandering around looking somewhat lost (as they were apt to do even under the best of circumstances). One would simply cajole them, waving the buttons in their faces until they were finally forced to take them. As was to be expected, they generally proved to be a fairly malleable lot. Sometime earlier that morning a person (or persons) had climbed up onto the gym building roof to hang an enormous sign down the side which read: "MCGOVERN--VOTE NO ON WAR!" Two custodians were in the act of climbing ladders on either side to take it down, while we, passing by in our herd, greeted their act with applause and cheers (for, as we had all been informed at the start of the day, no government building--and that included the structures of the entire school, temporaries and all--could be used for the purposes of political endorsement). During lunch period the campaigning continued, swelling into ever greater proportions, representing a veritable avalanche of political opinion. Once more we completed a march around the grounds, shouting: "Four more years! Four more years!" Casting up fists of accent on the chant. By this time our supporters were a vast raft of people wading out in all directions, consuming corridors and walkways, constricting (and constricted by) them; coming upon occasion across the paltry numbers of our opponents, surrounding them as they carried their slogans and banners such as "PEACE AND PROSPERITY," like we were some vast amoeba preparing for a meal. Practically laughing at them and their effrontery at trying to take us on, our great girth. We did meet up with one unpleasant surprise, however. During that circuit we found ourselves coming across Pete Obersdorf, who unaccountably it seemed had jumped ship and now numbered himself among the opposition. He who had formerly been (during the morning break) one of our loudest and most persuasive apologists. "What're you doing over there?" "I changed my mind." He shrugged with an impish smile. "You used to be with us--"
Somebody pushed him, and he was shoving back in their direction. All bearing ragged grins (for it was all in good fun of course). Soon enough we were getting back to the matter at hand. The campaign. "End the war! End the war!" Our enemies looked fervently forward, as though we weren't surrounding them on all sides. As though we weren't, in fact, the medium through which they had to pass. "That's what we're gonna do--"
"Yeah, by bombing some more?" This was Obersdorf again. "You're just being Commies--" one of the eighth graders said. There was more laughter, of a tentative and nervous sort. The presidential campaign had been very much a topic of discussion at my home for a matter of months. My father had been keeping well abreast of the current issues, for he had long been a student of political science (that was his major in college). "It's to end this terrible war," he would say quietly. "That's been such a drain on us and our economy for so long. That's the whole basis of his campaign." We would often have such conversations at dinnertime, with the TV news blaring away in the background. My mother would be over in the kitchen getting the meal ready, then briefly interrupting our debate with the delivery of the pots and pans to the table. After which she would sit down and commence her repast while we continued to talk in the midst of ladling out our portions of food (such discussions never seeming to prove of undue interest to her). "Nixon's for ending it too," I would point out. "Yeah well, that's what he said in '68. Or words to that effect." My father would smile a gentle smile. "See, I've got you beat there, son. I've known him for a lot longer time than you have." He had in fact been very much in McGovern's corner ever since that doughty South Dakotan had thrown his figurative hat into the ring, through the crisis involving Eagleton as well as other calamities (the weekly poll results being foremost among those, of course). It was a campaign which was increasingly appearing to be a longshot (at least, to judge from the surveys), but this did not stay my father's dedication to his cause. In fact, you might even say that it only served to strengthen his quiet resolve that the truth of the ideas was independent of mere expediency. "But how do you know you can trust what McGovern says either?" "Well--" A somewhat unpleasant look off. "We'll have to take our chances. But when you're on a sinking ship, you don't stay with the same guy, the captain who got you into the mess, you look for somebody different. Or try to find a lifeboat." Then he would put a handout. "Look at the economy. It's been in the doldrums for a while now. With all the problems in this country that haven't been addressed, and still aren't being addressed. What we need is a change of climate, just to get somebody new in there, in the White House. A breath of fresh air." "Why should we change if things are working out so far?" "But they're not. That's just the point, son, they're not." "Then how come they're saying he has a 20-point lead in the polls?" "You're saying they're not reliable?" "I'm saying they can change. A lot of things can happen. It's still a long campaign, we've got a month, over a month until the election. A lot can happen in a month." "Like Eagleton," I would smile (with the knowledge that I had engaged in a rather underhanded tactic with that reference). He would pretend he had not noticed my small jest. "Like Eagleton, or...something like that can come up on their side too. Something even worse. We'll just have to wait and see." Perhaps things might have turned out differently had I gone in to vote earlier that day; that is to say if I hadn't spent all that time campaigning and wandering around with the rest of the crowd. If I had still been caught up in the rally fever of the morning when I did it. And I suppose it might well be that what my father had been saying all those days (and weeks) before, along with his quietly persuasive tone in accompaniment, were beginning to have their effect. Or to take their toll. By the time I finally found the opportunity to head in to vote, it was almost the end of the day, and virtually the last opportunity to cast your ballot (between sixth and seventh periods). The line for the polls during the morning break and lunchtime had extended well out the door into the area between the A and B buildings, that spot with all those little bushes and such growing (which was the main reason why I had decided to postpone my visit both times). The polling place was actually located in A110, which is the classroom of Mr. Leventhal, the drama teacher; he'd voluntarily surrendered all of his classes for that day (donating them to the cause, so to speak). He was still on hand inside though, acting as the faculty member in charge of the operation. One further intriguing aspect of all of this was that we were able to make use of authentic voting booths, three of them which had been brought in under the auspices of the county, complete with those little curtains in front and the pull-cords which are used to draw them shut. All the desks in that room had been pushed back around to the edges, which left only the booths standing there in the middle, along with a table where two students sat, both of them eighth graders, in possession of a typed-out list. You were required to present your student ID, then they crossed your name off from the list (a precaution intended to prevent the more unscrupulous-minded from voting twice). Once inside the booth, with the curtains drawn behind you to ensure your privacy, you entered your choices (with the #2 pencil provided along with the ballot) onto the mimeographed sheet, for the many statewide propositions and initiatives as well as for the presidential choice. As soon as you were done, you were instructed to fold the ballot into quarters and insert it into the slot on top of the wooden ballot box, right after exiting the booth. As I say, I had been weighing the matter in my mind most carefully. When I finally reached the head of the line, I was checked off and handed my materials and pointed in the direction of the booth with curtains open. And so I stood inside with the curtains drawn behind, in that strange, cloistered little space, for a moment or two, musing down at the sheet in front of me; and, rather to my surprise, I found myself entering my check mark slowly and carefully beside the name of GEORGE MCGOVERN. Then, feeling something akin to relief, I moved on to work my way down the list of propositions, drew the curtains back at last and folded the ballot and inserted it into the slot, returning the #2 pencil to the girl at the table. There was a sizable article which appeared the next day about our mock election on page three of the San Sereno Courier Times, complete with a photograph of the polling place taken of one of the lines that had formed in front of that room when they were at their most imposing, along with various quotes from students (mostly the eighth graders who had been helping out with the registration) and a few of the teachers. That was by no means the end of the local coverage. The following month, after the real election had taken place, one more article appeared. This one, though shorter and located farther back in the edition, featured quotes from authorities in colleges and other figures across the country. Much was made of the uncanny resemblance of the results in our "dress rehearsal" (for that was the way the headline read: "LOCAL SCHOOL'S 'DRESS REHEARSAL' ELECTION MIRRORS REAL LIFE") to the actual event. I remember going down the columns and feeling a swell inside me, amazed at all the attention it had gotten, far-flung and otherwise. In parallel columns was printed, result for result, our percentages versus the statewide (or national) figures. The writer of the article noted that not only had our tallies predicted the winner of the presidential race, but we were accurate to within a percentage point of the final outcome. This was additionally true of several of the propositions. In fact, the only noteworthy difference across the board was that we had voted to pass the initiative to legalize marijuana. Other than that (and the fact that our turnout, at nearly 90%, was very much greater than the state and national averages) we were uncannily on target. On page two, the op-ed page, just underneath the masthead, there appeared an editorial about us and our school. The writer, who was perhaps the editor-in-chief himself (for that was what my father said was most likely the case), took several paragraphs to praise us and our "track record" and extolled us as burgeoning members of the local community. As he pointed out, we had proven in the event to be remarkably prescient and a perfect mirror of our times. Perhaps, he opined, the recent phase of youthful lawlessness was at last a thing of the past. For we had demonstrated that we were well on our way to becoming model citizens and fine representatives of our community. It was his conclusion, and (he said) should be the conclusion of every hopeful and conscientious citizen with an eye toward the future, that ample cause for optimism could be gathered from the example of us and our school. Indeed, we had every reason to feel proud.